Riviera Italian and American Foods located at 3220 N. Harlem Avenue (near the intersection of Belmont) doesn't really qualify as a restaurant per se as it is a limited service grocery with a deli and sausage shop. The Riviera is owned and operated by the family of Carmelo Pugliese, any number of whom can be found any day of the week in the store. For locals seeking lunch options, Da Riv, as it has affectionately become known in my office offers one of the best bangs for your buck with it's deli selections that range in price from $3 to $5 depending who you know and what you order. Carmelo and/or his son can usually be found at the Deli counter around lunch time everyday putting together sandwiches for neighborhood stragglers who drop in and out for sandwiches to go. I always ordered from the menu, until one day, our friend Zim advised that he had great success offering to let Carmelo put a sandwich of his discretion together for him. In a particular fit of gluttony, I ran the gamut of the meat case to have them prepare what is proudly known today as the Will Special: Hot Sopressata; Hot Cappicola: Salame de Prosciutto; Prosciutto Ham; (Roast Beef on Fridays was added a few months later);fresh mozzarella, a just a bit of hot giardinera on a roll I picked myself from the bread bin. The cost? $3.50 though sometimes, for reasons of which I do not inquire, it costs $4.00 or $4.50. That's a real bargain at any of those prices in a neighborhood where one may be forced to pay one and a half to two times the price for some crap from Jimmy Johns in the alternative. The Will Special now sits in infamy, with its ingredients on a yellow post it note, next to the meat slicer on the wall in the back. I always feel a little guilty as I head to the register that I'm taking advantage of the Pugliese family at that sandwich price. So, I usually buy a quart of their excellent frozen red sauce, some of their top notch frozen ravioli, and maybe a bottle of their homemade giardinera or some of their good quality olive oil and/or tinned tomatoes. If I'm lucky, they may have a left over arrancicni from the weekend, I can pack in my to go bag. Da Riv's arrancini are particularly good. If you're in the mood for dessert, the little lemon knots at the register fill the bill well. Da Riv and the Pugliese family, and are true culinary gems iin our little corner of the world. For that, I'd like to nominate Da Riv for recognition in the LTH Great neighborhood Restaurant program (even though it isn't a restaurant). Last edited by YourPalWill on June 13th, 2005, 3:40 pm, edited 1 time in total. Another thing that I think makes the Riv great is its frequent selection of home canned goods. Olives, giardinara, etc. In fact insist on the house giardinara when getting as sammy or you may get the factory stuff. Their canned goods add a level of artisinalship to their offerings that is especially cool. Vital Information wrote: Great choice! Ditto. The arancini there are quite nice. I never realized the Will Special was something I could order by name. I've found the sandwiches off the menu, while delicious, a touch dry for my taste, and I think the giardinera would really elevate the product. I like this place a lot, for all the reasons Will lists. To counterbalance my qualms and quibbles expressed elsewhere about bestowing the title of "Great Neighbourhood Restaurant" on a salumeria that only has one table for a few months a year and no table service ever, Riviera is a great shop and deli and the Puglieses are indeed very nice people. Though it's been mentioned elsewhere on the board, it should also be mentioned here that the Puglieses offer several house-made pork products (different styles of sausage, sopressata and more) which are all of very high quality. 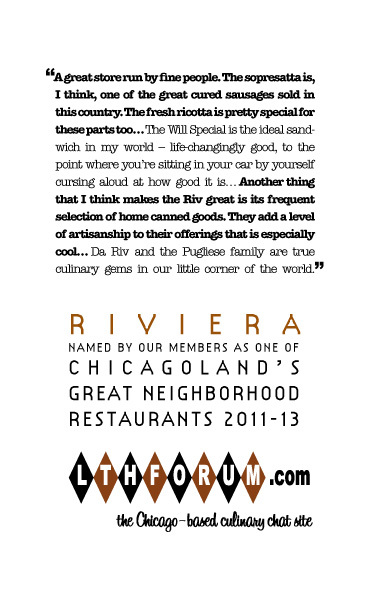 I've long been a supporter of Riviera, and I'm glad that your postings on the "Will special" and Riviera ahve motivated more folks to give them a try. My experience with them, letting the "sandwich artist" at the counter make me something of his choosing, in some ways exemplifies why I think they are a good choice - I have a level of trust in them, the way you have with a friend or a good neighbor, that they'll try to do their best by you. Also, I may be alone in this, but I've always enjoyed the lemon cookies they sell up by the cash register. A great store run by fine people. The sopresatta is, I think, one of the great cured sausages sold in this country and on a par with, eg, Molinari in San Francisco. The fresh -- fresh as in sitting in a straining basket on the deli counter, curd separating from whey, fresh -- ricotta is pretty special for these parts too. I hate to suggets it, but does this mean Bari, Dirk's, Paulina and others are candidates? Spent quite a bit of time in NY last year and tried a bunch of really nice Italian cured meats from local sources (for tourists, the Grand Central Market has a nice selection). None were the calibre of Riv's sopressatta. So, yeah, a GNR. My wife's favorite sandwich in the world is the dressed prosciutto and mozz at Da Riv. The Will Special is on my top 5 list. They're doing everything just as well as always, and the aisles continue to outshine even beloved Bari. Many visits and hunks of house made Soprassata, Capicola and Cacciatore later, not to mention fresh mozzarella and a wide assortment of sourced cured meats, I'm a bigger fan than ever. Solid Si for GNR renewal. I really enjoy going to the Riviera. While I prefer the D'Amato bread used in Bari's sandwiches, the homemade soppresata and cappicola (which the couter-guy pronounces "cappagool") at the Riv just blows me away everytime. I like that they have a specific way of slicing each type of cheese and meat that they carry. It shows how much pride they take in everything being perfect. The Riviera is perhaps the best of a dying breed of neighborhood Italian delis. It definitely deserves renewal. A fourth or fifth or whatever it is for a renewal. Wonderful store, their Hot-Italian and/or their Will-special are two of the best sandwiches in the city (and are still shockingly priced at about 4 bucks). They make fresh mozz every day, 3 times a day on Saturdays. And around Christmas time, the homemade cuccidati, the fig-cookies (homemade by little old Italian grandmothers in the area) are one of my favourite treats of the season, and one I look forward to most of the year (despite looking - hard - I have yet to find a plain cuccidati, no frosting, that is anywhere near as good). A no-brainer GNR IMHO. This is our favorite Italian deli-bar none! Their homemade cappricola is out of this world. The selection of salami, sopressata etc is really awesome and cut to order. My little girl loves the fat salami sticks and my older girl loves the arincini. Hubby always gets a sub while I stock up on the sliced meats and the wonderful octopus salad. We love the marinara and their Italian sausage-both hot and regular. We periodically get fresh parm and romano cheese which they grate beautifully. The fresh mozzarella was awesome this summer for caprese salads. I also buy Del Ape dried Italian (not pizza) seasoning here as well as canned tomatoes and dry pasta. The family is so nice to us and they know our likes and tolerate my kids running around the place (and requests to use their bathrroom-everytime we visit!). Prices are less expensive than Bari.